We are going to Sweden for the Medieval Week in Visby, and the husband need a jacket for those chilly nights that can occur even during the summer up there in the north. 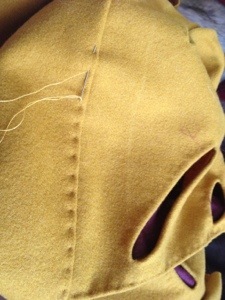 Since he already has a pair of hosen, I basically just used the left over fabric to create the bodice in yellow wool. I didn’t had any red wool left, so I decided to line it with red linen instead. Back and front with the red lining. The sleeves are suppose to be HUGE according to the woodcuts, but he didn’t wanted too big sleeves, so the arm hole is about 76 cm all around; and since I’m in a bit of a hurry of finish it, I didn’t wanted to much work and therefore decided that about 6 cm for each band was the biggest I could make it, and it still look good … And 76/6 is about 12 …so 12 for each arm it is. 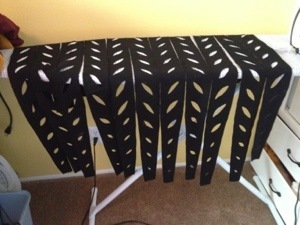 Each band has 13 slashes, and it took about 4 hours to cut 12 band …then I wanted to line it with white silk, and each band takes 1-1,5 hour to sew. *Wohoo* …good thing with wool and silk is that it is at least very easy to just cut and rip, so that didn’t take more than a couple of minutes. 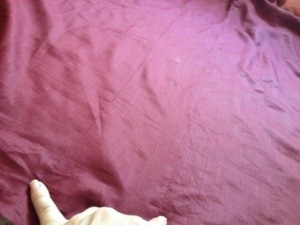 The silk ha the same width as the wool, but is slightly longer so it will bulge out of the slashes. 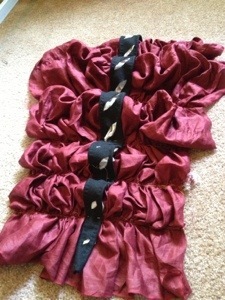 Back and front of each silk lined wool band. Note that the each band is slightly smaller in one side to fit around the much smaller wrist (compare to arm hole). 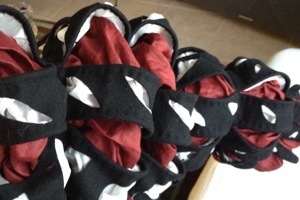 I might even remove two bands underneath the arm …this will make the cuffs even tighter and also take away some uncomfortable bulging in the arm hole. I can’t tell exactly how to do until I have had a fitting with him though. 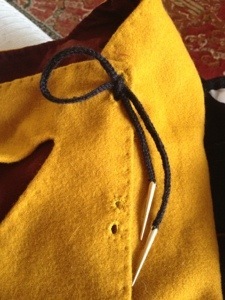 The sleeves is in three layers; the black bands, the red puffing and the lining that will keep everything in order. 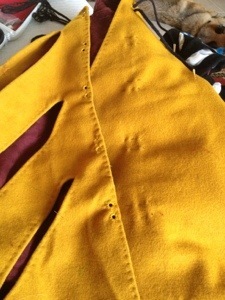 Then I pulled a thread on the same amount of lines on the puffing fabric so I had a straight line to follow. 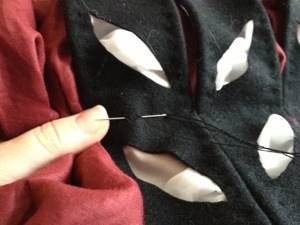 Then I sewed the puffing onto the lining, and then started to add the black stripes on the top of everything. I also hemmed the backside of the bodice, but my markings on the front has disappeared during the last days, so I need one more fitting to finish that part, including the lacing holes on one side. 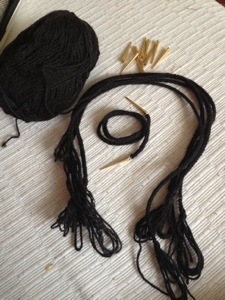 So until then I finished the strings needed to close the wams. The side seams is also finished by stitching small “invisable” stitches, this is the period equivalent of ironing the seams flat (as you would do on modern cloths) and since the seams are folded to one side, it also gives some extra strength to the seam …and the small dotted pattern is what (for me) gives the dress that extra look of completeness. 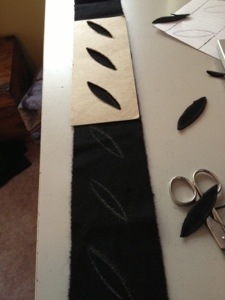 -make the stripes for the sleeves same size from top to bottom, and instead put some extra around the armpit. Since I calculated the phasing to fit around the wrist, I had to make some ad hoc solutions when I used lesser amount of black stripes as I planned to. – the front should probably be two square pieces (mine is a triangle, the tip of the triangle is we’re you can see the lacing in their front), since there is wood cuts that shows a lacing on both top parts (right next to the shoulders) on the front. 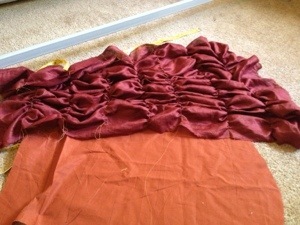 -a bit bigger piece of fabric for puffing; ratio 2:1 should probably give a bit more puffiness. 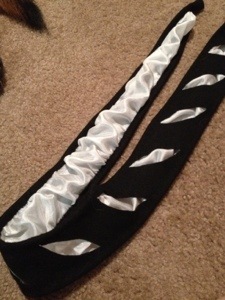 -line the backside of the stripes; this will keep the white silk puff out more in the front. – when you look at the woodcuts you usually just see only 3 visible strings for lacing in the front, I’m not yet sure of how the front would stay in place, since that would make it bulge between the top and the bottom. I have therefore six strings on the side …so that needs to be look into a bit more. I still want some more slashes on the bodice, but there is no time for it, but it is still possible to add someday in the future. Total time of making the wams is about a week …give and take some day. 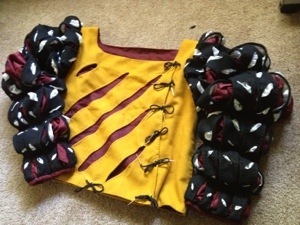 This entry was posted in Landsknecht, Sewing and tagged construction, doublet, Landsknecht, Slashes, wams, wool. Beautiful, as always and so well thought out! Coming out of lurk-mode to say Thank you for being so nice to me after the parade in Visby. My hubby has fallen in love with the sleeves of this Wams, so I’ll be doing my best to emulate them for his next costume. Hope to see you again next year. It was very nice to meet you too and considering the great outfits you both was dressed in, I have no doubt that you are going to make a fantastic wams! Please don’t hesitate to contact me if you have some questions!